3 colors in Animal Circus (red, green, yellow) total 12 bet options. In additional ,there are 3 more options for betting, Banker, Tie and Player. Cannon bonus: Cannon will randomly appear and bring you 2, 3, 4, 5 multiplier win. 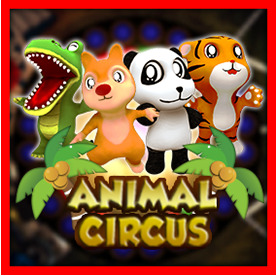 Stage bonus: Stage feature Animal Circus will randomly appear and give you extra stops, more opportunities, more wins. Color bonus: When you win color bonus in Animal Circus, any animals as long as this color are considered to win. Gold animail bonus: When you win gold animal in Animal Circus, these type of the animal, no matter what color are all wins.